I have had a long standing love affair with Gwen Stefani’s music and style. In particular I love her L.A.M.B. handbags! I am one of those girls that would be happy with a new purse every week, and while I may admire the designer purses I won’t spend the money on them. It just seems too frivolous to me even though L.A.M.B. bags tend to be much less than a lot of the designer lines out there. Mark got me a L.A.M.B. handbag several years ago that is the perfect size for lipstick, cell phone and small wallet for going out with the girls, and I love it. The quality of the hardware fascinates me every time I use it. Many times I thought I would like to have a L.A.M.B. handbag that was big enough to use on a daily basis. Well thanks to Dad sending me Christmas money I was finally able to order the bag I have had my eye on for over a year now, and I got an amazing deal on it. Sure it may be last season’s design, but I don’t care…it is THE ONE I wanted and I am so happy with it! The back side of the purse has the M B so it spells LAMB. 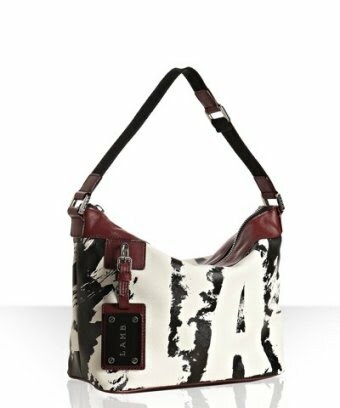 I love the red accents against the white and black, and while I’m not a huge fan of showing off labels or the brand name of what I’m wearing or carrying, I even like the L.A.M.B. tag that is attached to the front of it. It is pretty subtle compared to some other designer lines out there. Next > What Do You Know For Sure?